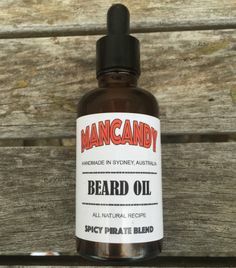 Following on from the ‘Cedarwood Beast Blend’ Beard Balm, I have since been using ManCandy ‘Spicy Pirate Blend’ Beard Oil. ManCandy is based in Sydney Australia and was started in 2015 by a hairy Aussie that goes by the name of ‘Micko’. All of the ManCandy Balms and Oils look like a proper mans product, they are large in size with the Oils being 50ml and the Balms a whopping 60ml and the prices don’t reflect the size of the product, you get that 50ml of oil in a glass bottle with a glass dropper for $25 (AUD) and that at today’s exchange rate is only £12.68! ‘Spicy Pirate Blend’ is the type of oil I like, it’s a thicker oil and so works better on beards that have a tendency to be a bit unruly or a bloody mess like mine, thicker oil is also better in my opinion if you have a bigger beard. This oil is has a spicy citrus scent and so it will appeal to those that like a sweet oil as well as those that like a spicy oil. ‘Spicy Pirate Blend’ is a base of organic and natural Grapeseed, Argan, Coconut, Hempseed and Camellia carrier oils into which is blended essential oils to give it that spicy citrus scent. I receive a lot of beard care products and a select few make it into my favourites collection and that is exactly where this oil is headed! So why are still sat there reading this? Get yourself onto the ManCandy website and treat your beard to some products that wont let you or your wallet down! You can also keep up to date with all things ManCandy on Twitter, Facebook and Instagram and also keep an eye for the release of the new Mancandy Homebrewed Beer Soap! ← How hard does Labour try to win?